Wabi-Sabi is a Japanese aesthetic that reflects the very core of Zen philosophy. Age, imperfection and impermanence are the underlying qualities inherent in Wabi-Sabi. This cultivated and refined approach in all art forms suggests the sublime transient beauty in all living things. It is a significant concept in Japanese culture, and one that can be appreciated in many art forms such as pottery, painting, as well as gardening. In applying this concept to gardens, it is important to honor and respect what is inherent in the natural, unaltered landscape. Nature is abundant with random imperfections. An ancient tree, enduring years of turbulent weather appears sadly leaning while the roots remain surprisingly anchored to the earth. Random patterns of wild plants echo the innate flow and of nature; this is certainly apparent in the abundance of the often disdained “invasive plants.” Applying the simple principles of a Asian inspired garden provides a place for contemplation, calmness and simplicity. What remains is the very essence of the pure, natural world—its imperfections and inherent flaws remain constant; it is the acceptance of such flaws that opens us up to the raw, unaltered beauty of nature. The brilliance of Autumn needs to be savored and revered because it is so fleeting. 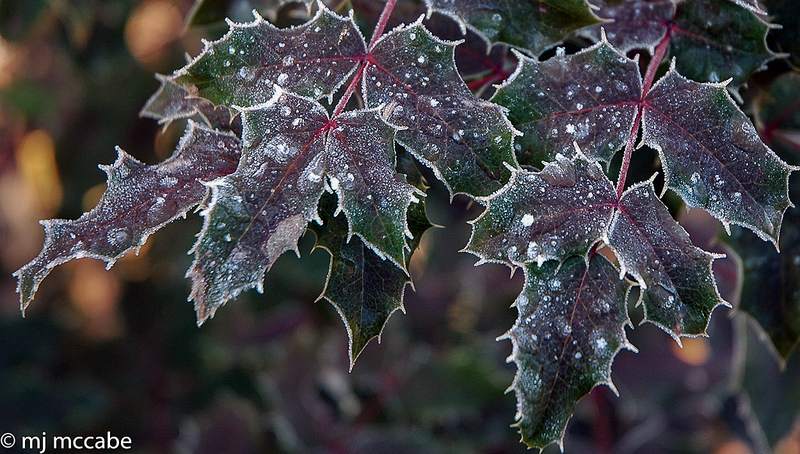 Wabi Sabi is the beauty, acceptance and total acknowledgement of the evolving seasons. 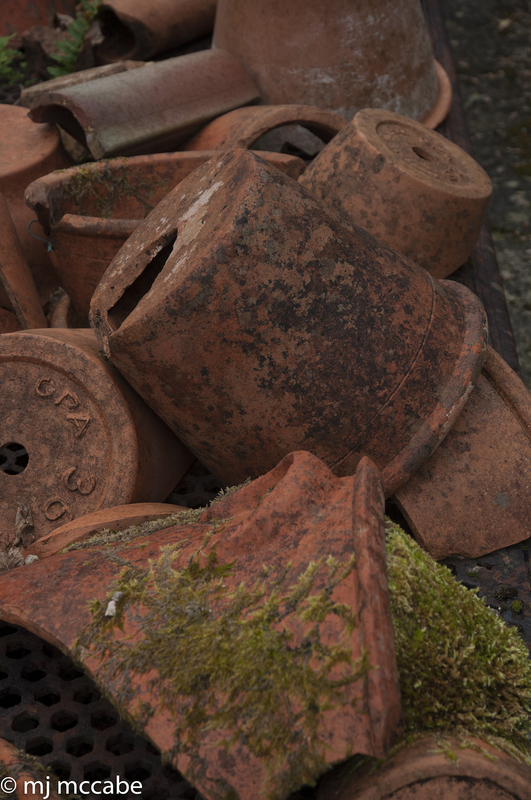 Age and imperfection reflect an inherent quality— broken, moss covered and weathered flower pots invoke a feeling of Wabi-Sabi. Furniture that shares an affinity with the surrounding garden site creates a kinship that is welcoming and inviting. An antique weathered pot is a beautiful focal point in this garden—instilling reflection and even a sense of melancholy. Wabi Sabi is the beauty of plants in flux: emerging, flowering and then receding into the earth. The craftsmanship of blending wood and various stone sets a tone of serenity and repose-as all the elements meld together over time taking on a rich patina of age. A serene landscape provides contemplation and reflection. 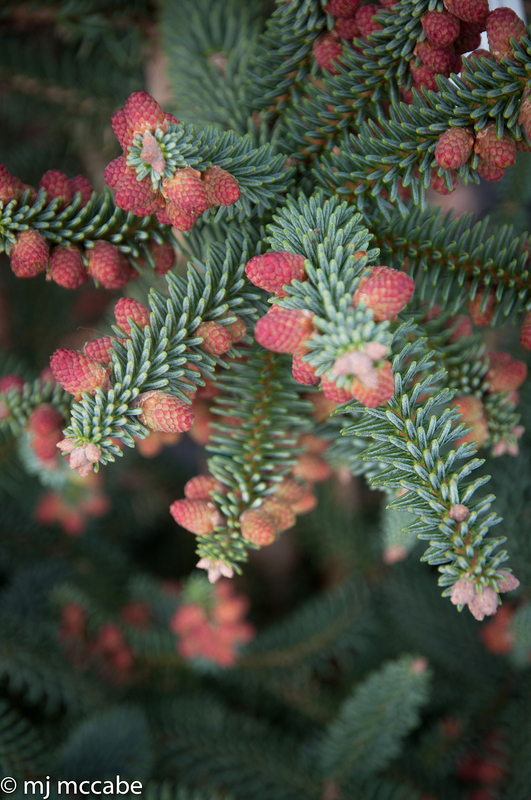 We all know that evergreens provide year-round color and consistency in our gardens, but it is vital to remember they also provide a strong sense of order that lends permanence and stability to the overall landscape. 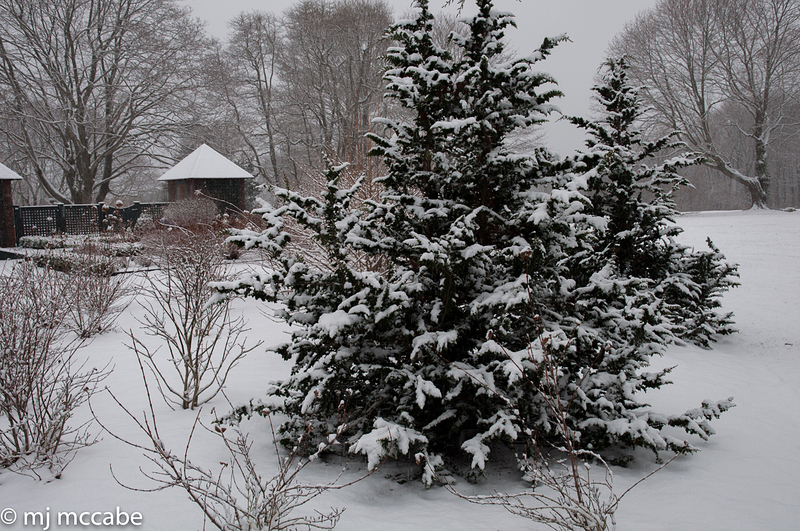 In Winter, when the trees become barren and the perennial borders are totally devoid of color, it’s the broadleaf and needled evergreens that provide the visual interest that we all crave during the long months of Winter. 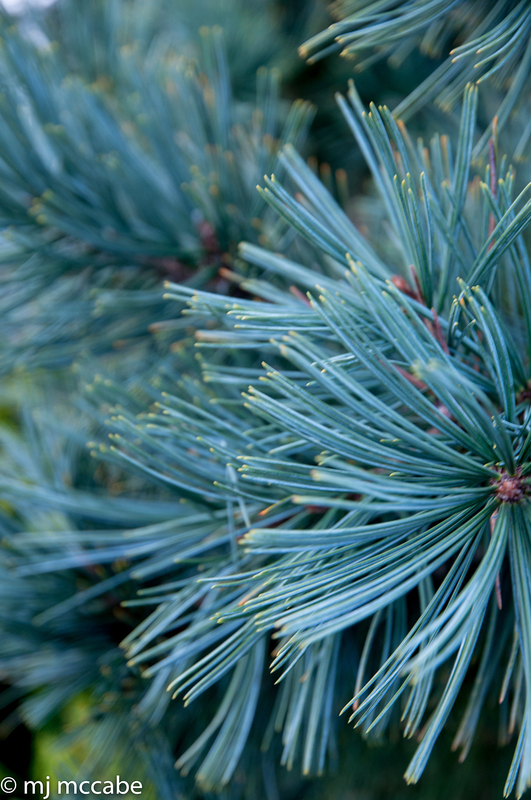 I like to think of evergreens as the real bones that form the overall character and backdrop of a beautiful home landscape. 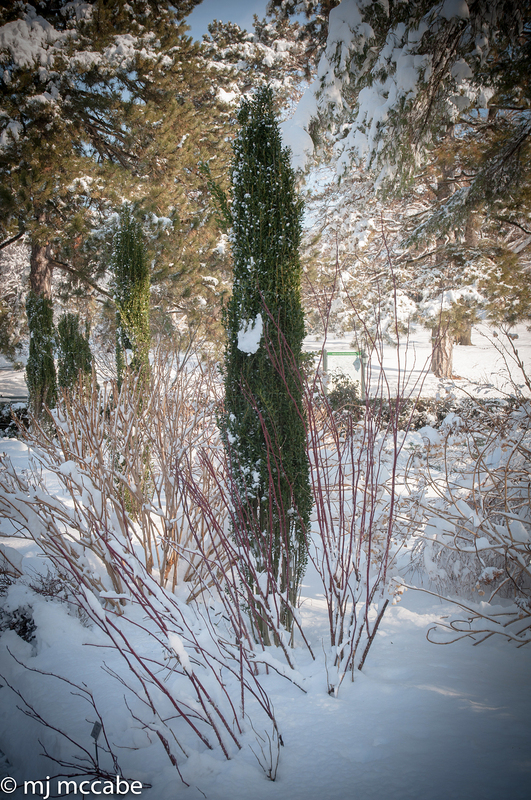 They are always formidable — remaining the constant sentinels of the garden. 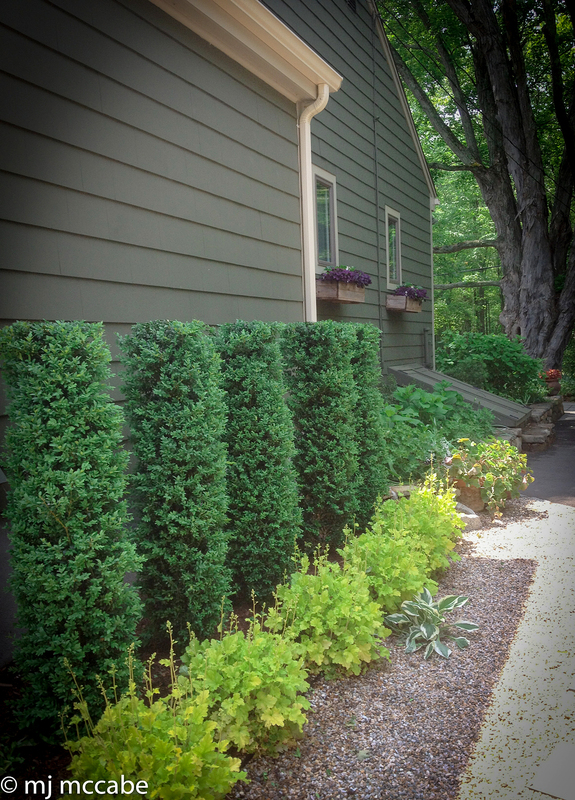 A well thought out landscape using evergreens can provide the initial structure for an inviting outdoor room that can be further embellished with flowering shrubs and perennials. 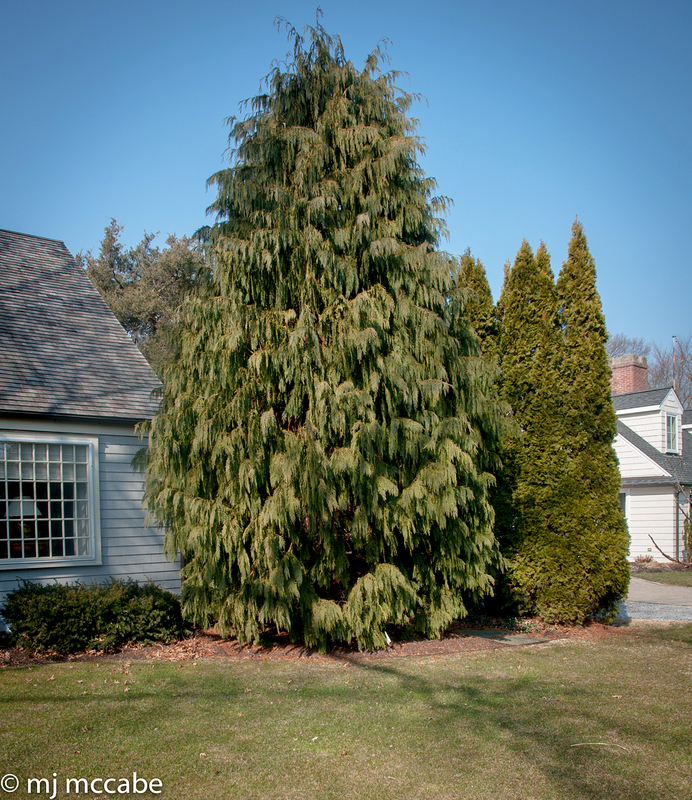 For this reason, evergreens as well as significant deciduous trees need to be the first considerations when planning a new landscape. 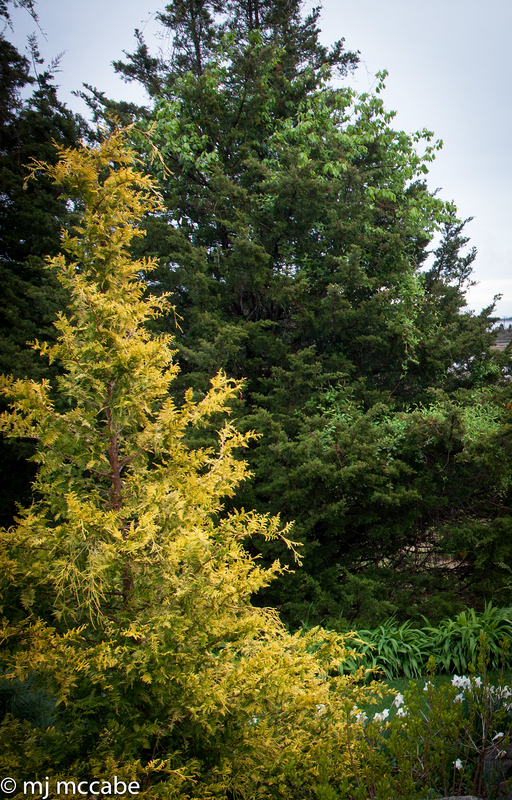 Not only do they add stability and balance, but their solidity unifies and provides an underlying structure that makes the garden come alive — holding the eye throughout the entire year. Madison drawing with walkway–the first step in creating a cohesive design and to make the overall design come alive and visually inspiring. 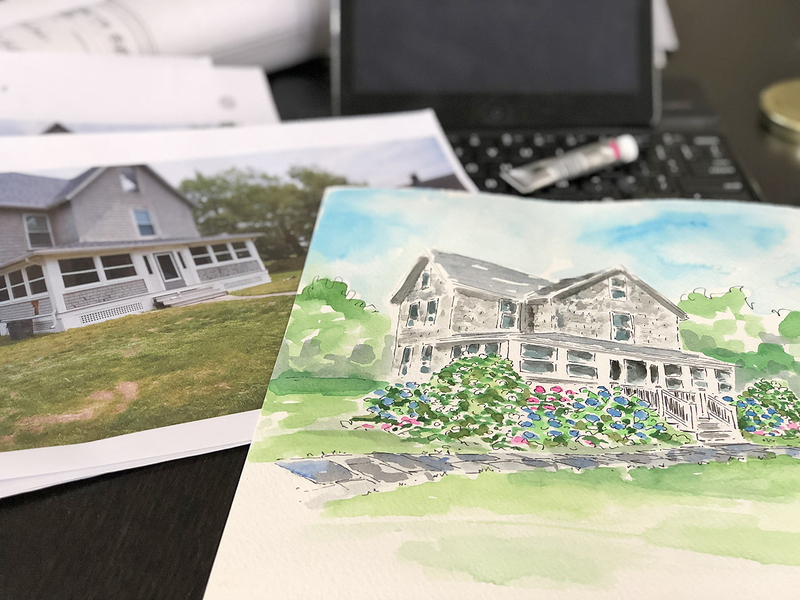 The beginning stages of a garden design–the first step is to define and layout the hardscape–we decided on a 4′ wide bluestone walkway that makes the house more inviting–the existing concrete front walk to be removed. 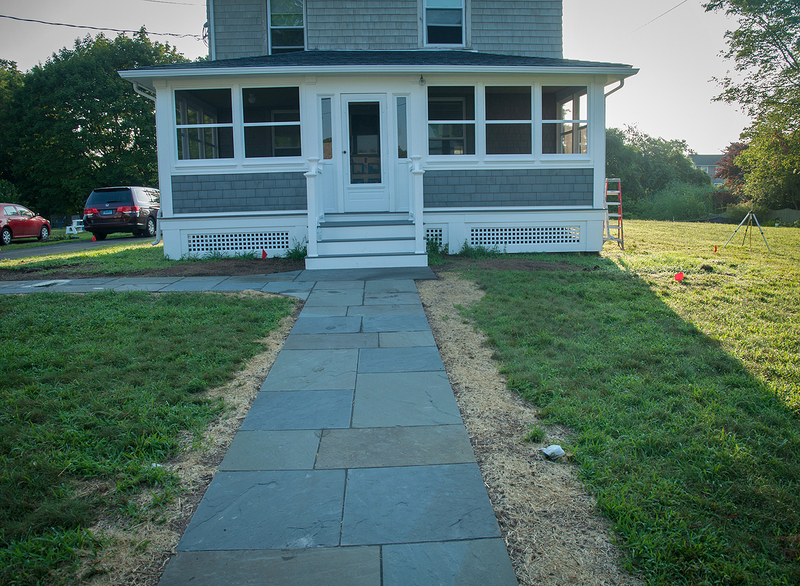 The old concrete walkway is removed and replaced with a 4′ wide bluestone walk that leads from the mailbox to the front steps as well as incorporating a new entrance on the left side from the driveway. 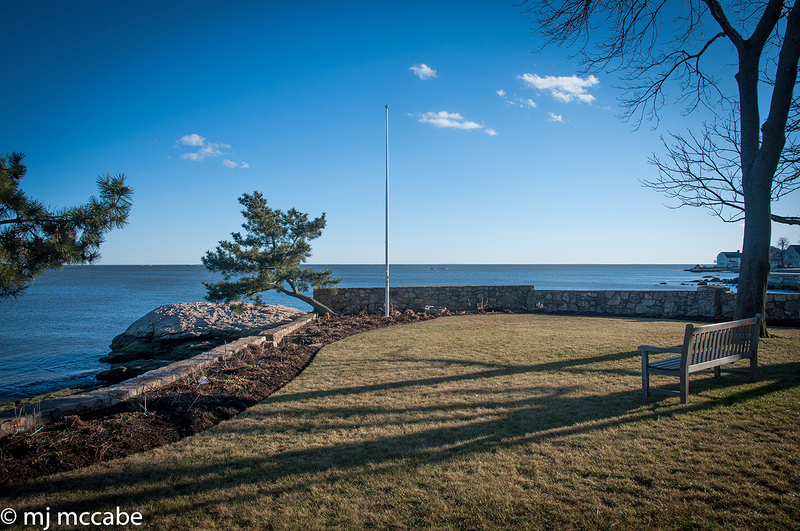 New bluestone walk to be installed –area regraded allowing generous space for planting beds –An update on a 1920s shoreline cottage. 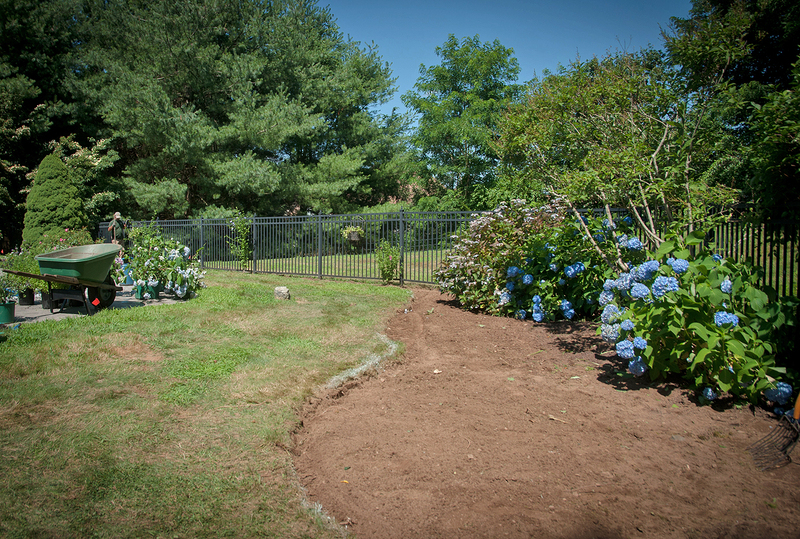 Fresh top soil and compost is added to the new garden beds –plants are placed prior to final planting–a lovely combination of hydrangeas, shrubs rose, phlox, and lavender make up the core of the plantings-later bloomers such as crepe myrtle and caryopteris will carry the color into late September and October. 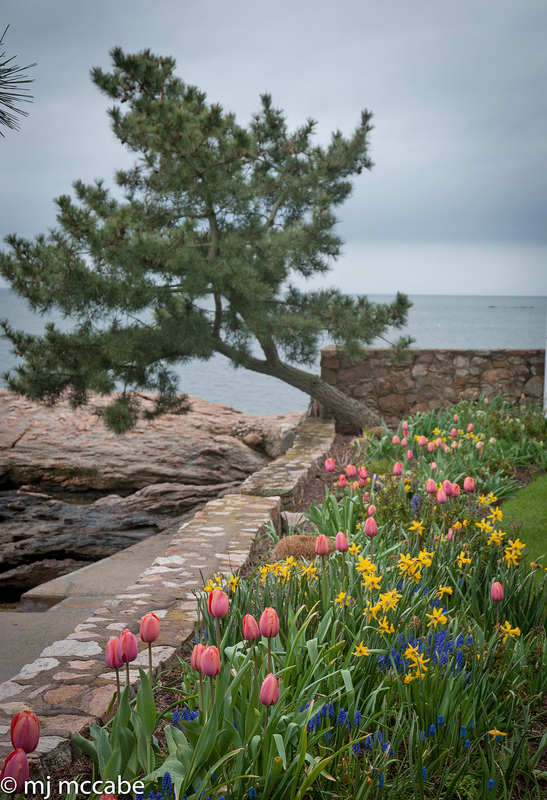 The planting scheme shares a nice affinity with the bluestone walkway–enhancing and defining the entrance to this shoreline house. 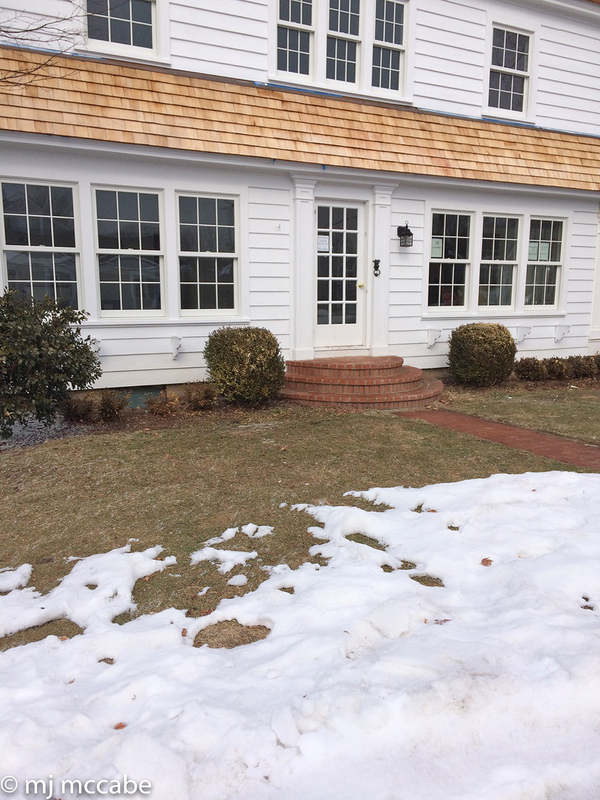 An outdated front entrance that needs some inspiration. 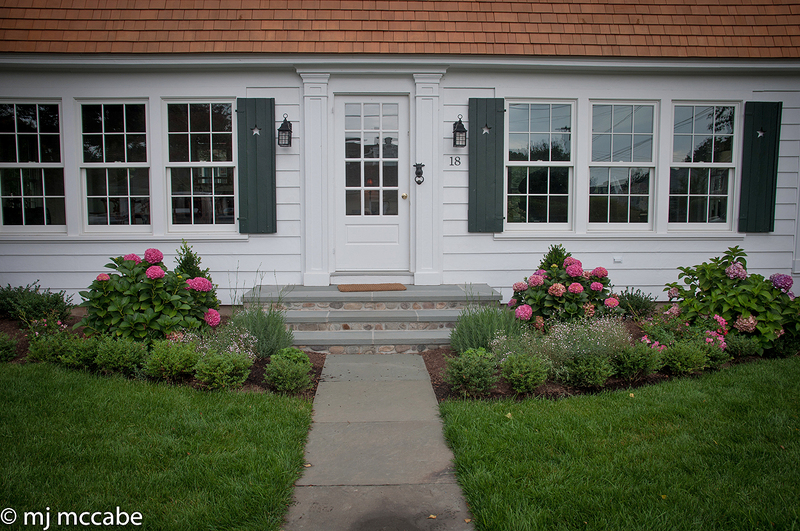 Creating a new front entrance with stone and new plantings. 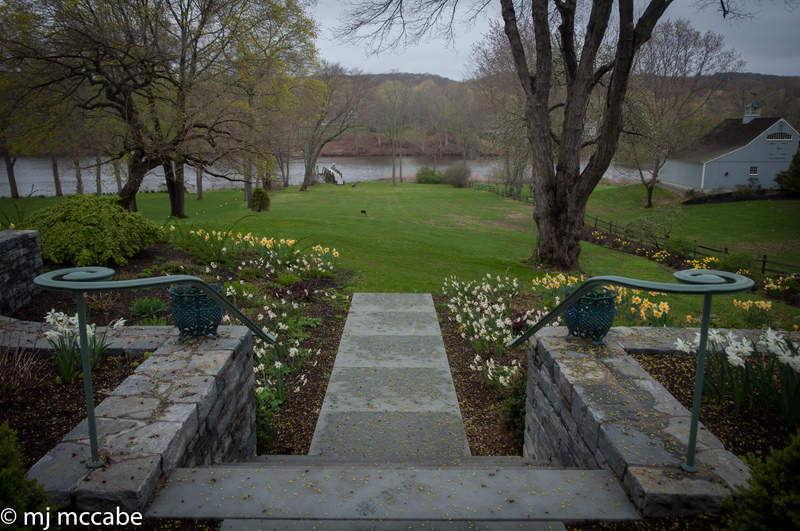 New bluestone steps and generous bluestone walkway and nicely proportioned foundation plantings make this house very inviting . The house in spring with an inviting spring bulb planting -a perfectly placed red Japanese maple frames the corners of the house. 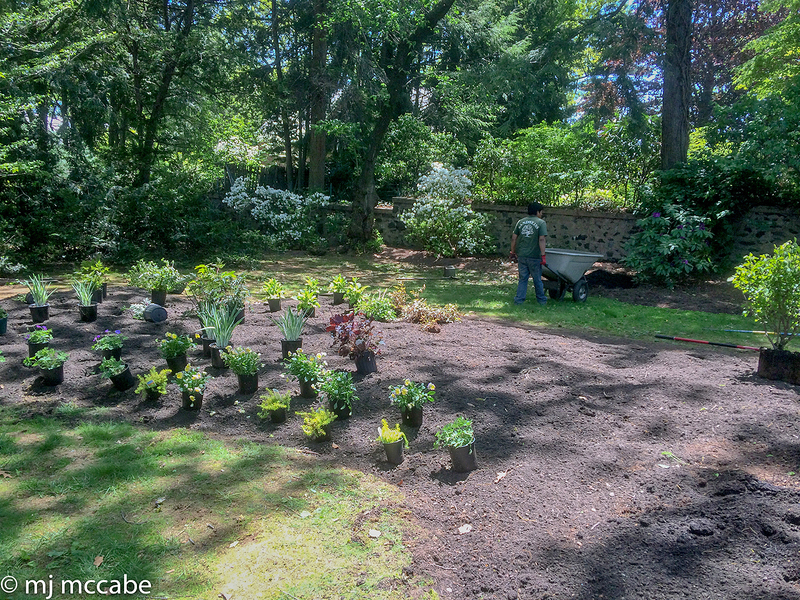 Adding to an existing border to make it more interesting around a pool. 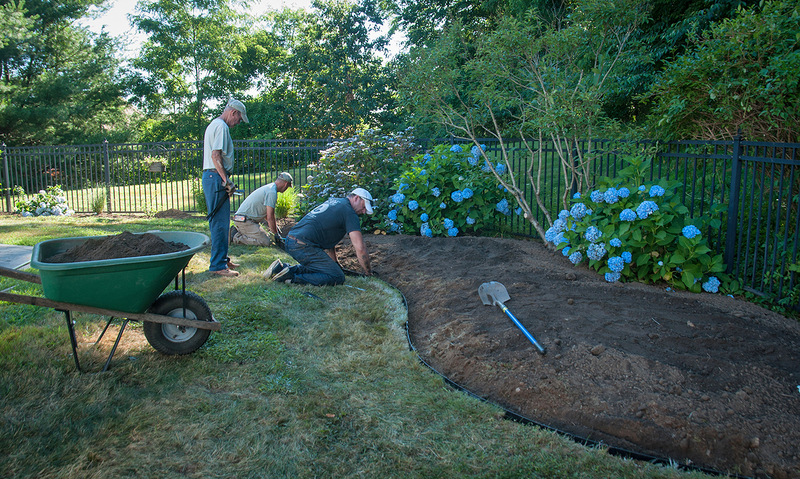 An existing border is enhanced with the removal of grass to allow for new long blooming perennials that will extend the overall interest in the garden around this swimming pool. 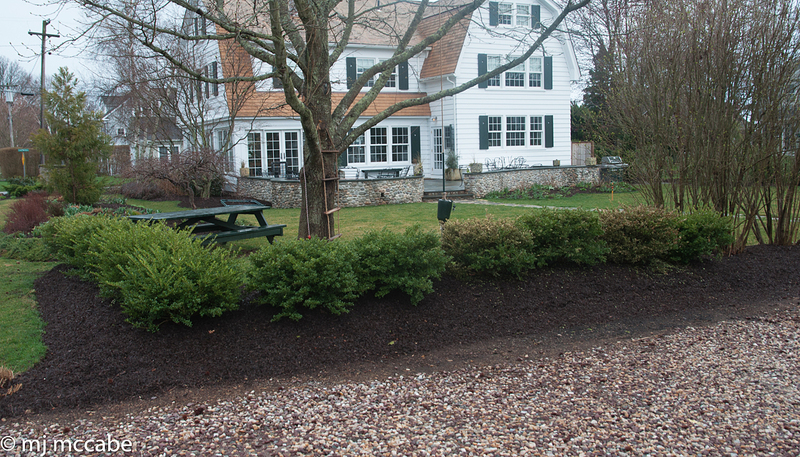 Metal edging creates a nice crisp line that defines the new perennial border–the existing soil has been enhanced with as additional layer of rich compost prior to any new plantings. 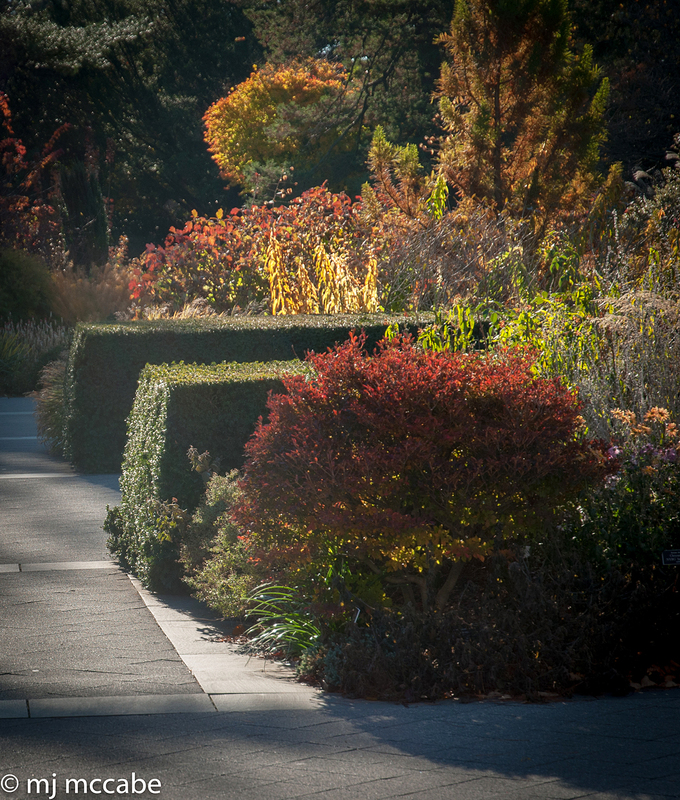 A differing array of shrubs and perennials are added to provide a long season of color that carries the border into Autumn –a Spring bulb design will be added in late Fall for wonderful color in early Spring . 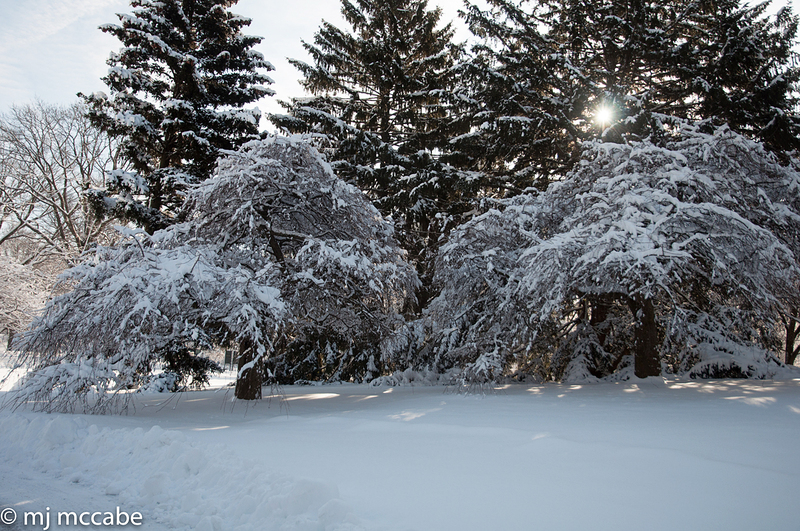 A more formal stone entrance is enhanced by mature and majestic trees . In contrast to formal stonework, large flat stepping stones create a lovely walkway that makes the garden entrance enchanting. 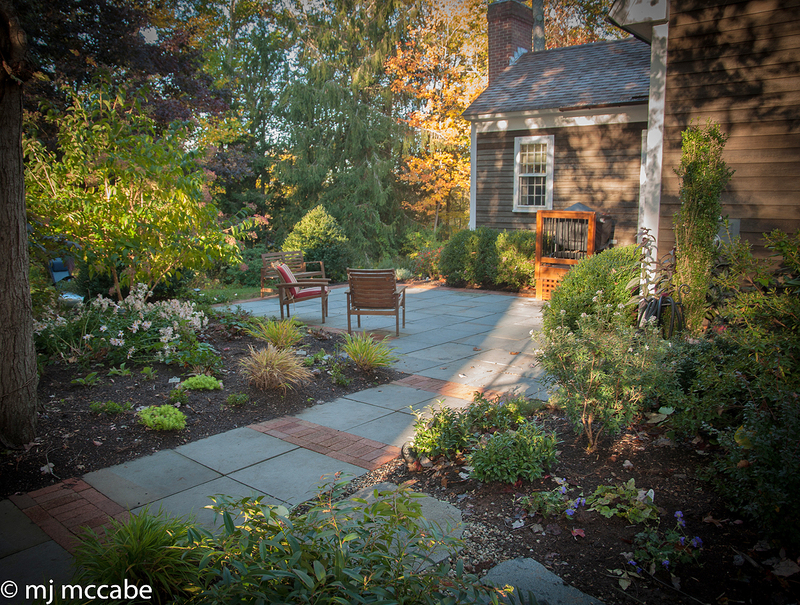 Stone work and gardens share a natural affinity–the stone being a permanent element while the garden is always evolving sharing a kinship with the changing seasons. 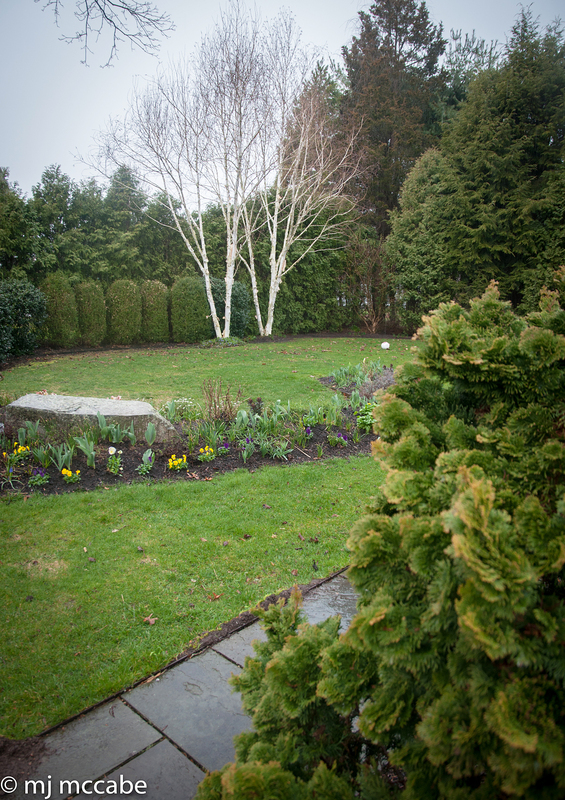 A perfectly defined garden –waiting for an inspired planting design. 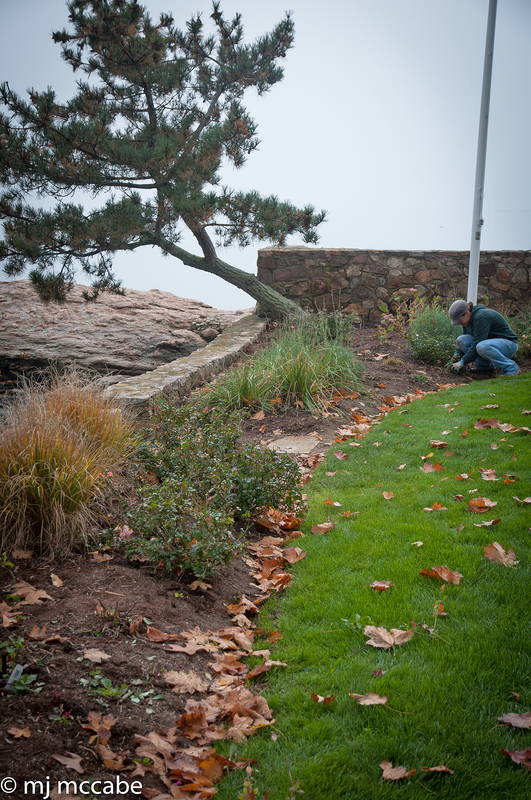 A natural rock ledge with a stone wall creates the framework for this seaside perennial garden –bulb planting in late Fall. 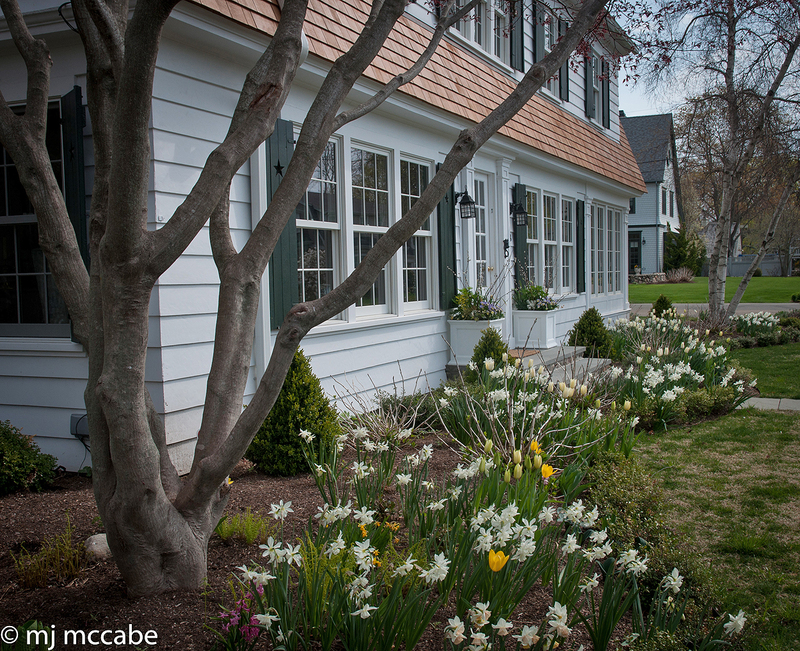 A layered Spring bulb planting enlivens the garden before the Summer shrubs and perennials make their annual entrance . The garden in early Summer. When designing walkways for your home think of them as being generous in size, well-defined and most importantly very inviting — aim for them to be at least 4-6’ wide to give maximum appeal. Walkways that are lavish in size and possess a natural kinship to the site feel well organized and inviting to visitors. 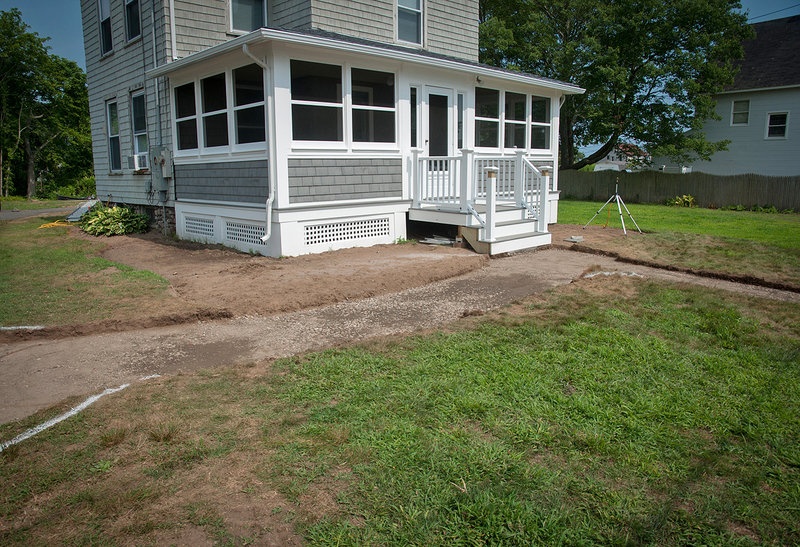 One of the best ways to preview the shape and flow of the walkway is to lay out a temporary path with draping a garden hose or use a brightly colored can of spray chalk. This makes the potential design more visual and fluid and it can be reshaped and altered several times before the actual construction of the walkway begins. It also always you to visualize the potential walkway from different vantage points both from the outside as well as from the interior of your home. Try framing your walkway from an upstairs bedroom as this will provide a whole different perspective. Consider how the walkway curves and frames not only the planting bed but the architectural lines of the house and surrounding natural terrain. 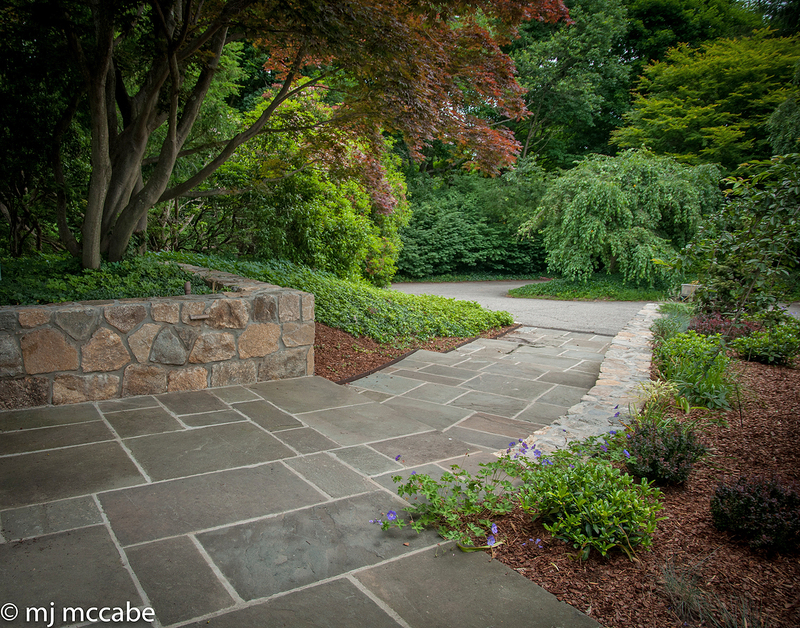 To define the transition from driveway to the actual walkway, allow for a larger entrance pad or generous flair that might be detailed in a different stone pattern from the main walk. 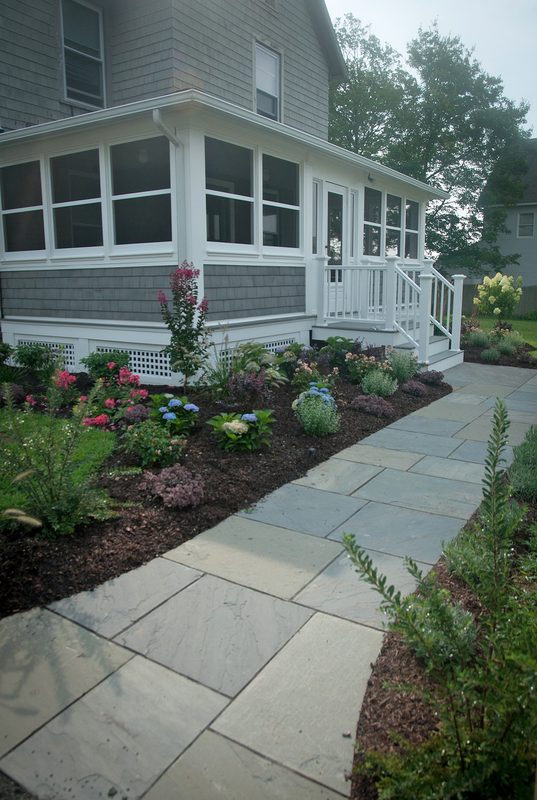 There are a number of different materials to choose from when selecting stone for your home walkway. 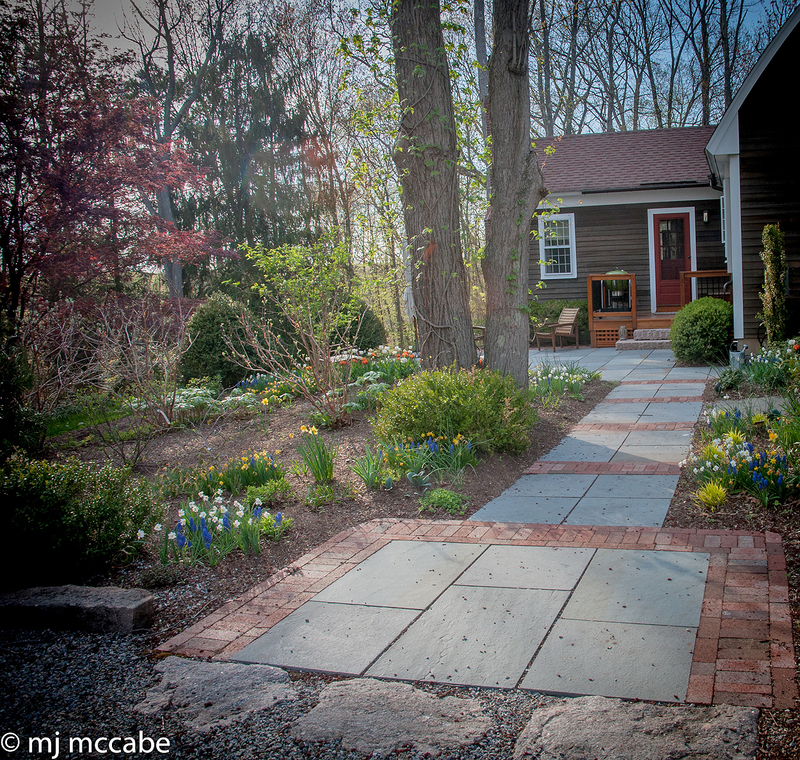 Some popular options include cut bluestone, brick, or pavers—all should be laid in a well-prepared base that has been heavily compacted and extremely well leveled. Selecting the right material for your project will lend a sense of safety, permanence and long-term durability. 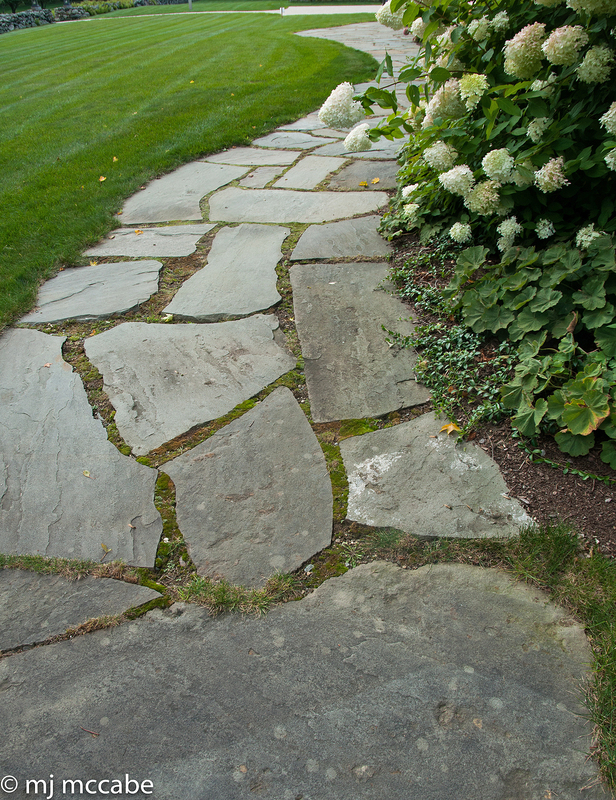 Avoid inexpensive alternatives such as crushed stone or randomly placed stone as they will be difficult to maintain and cause uncertainty when underfoot. 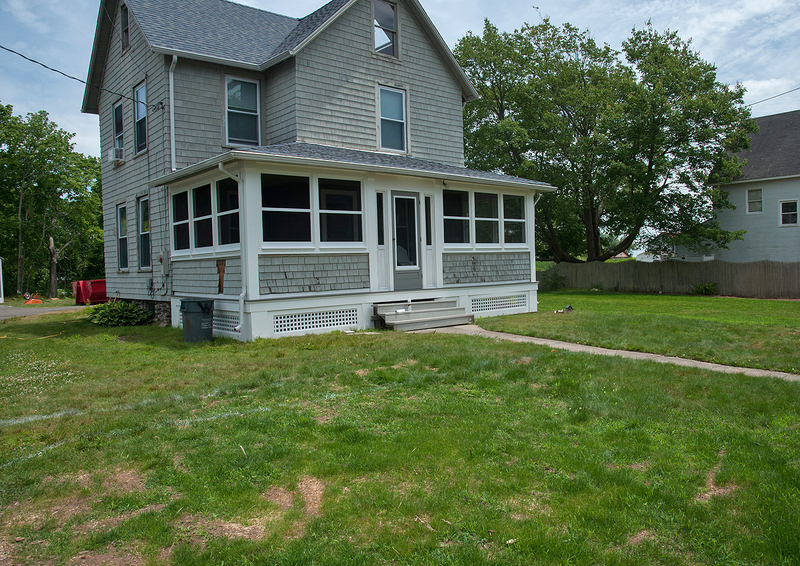 These types of materials require a lot of weeding and ongoing upkeep and will not provide much stability and long-lasting endurance. 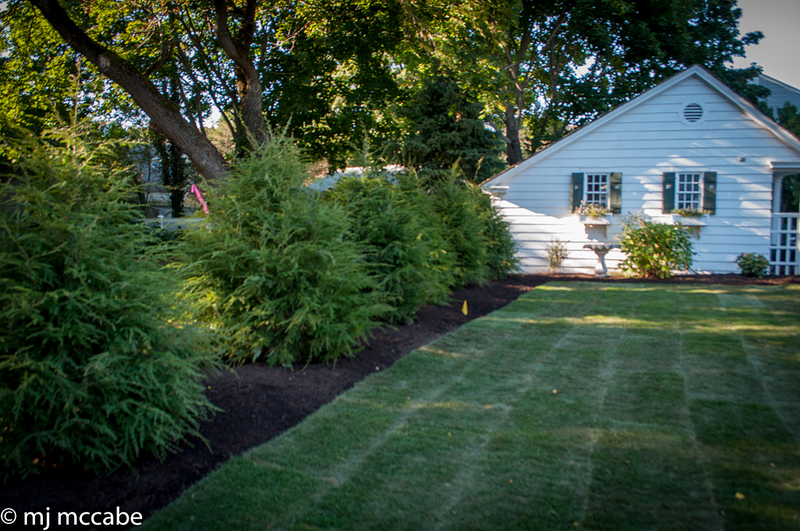 As you layout your walk, allow for a wide, gracious planting bed that will frame the enhance the front of your home as well as enhance the overall landscape. 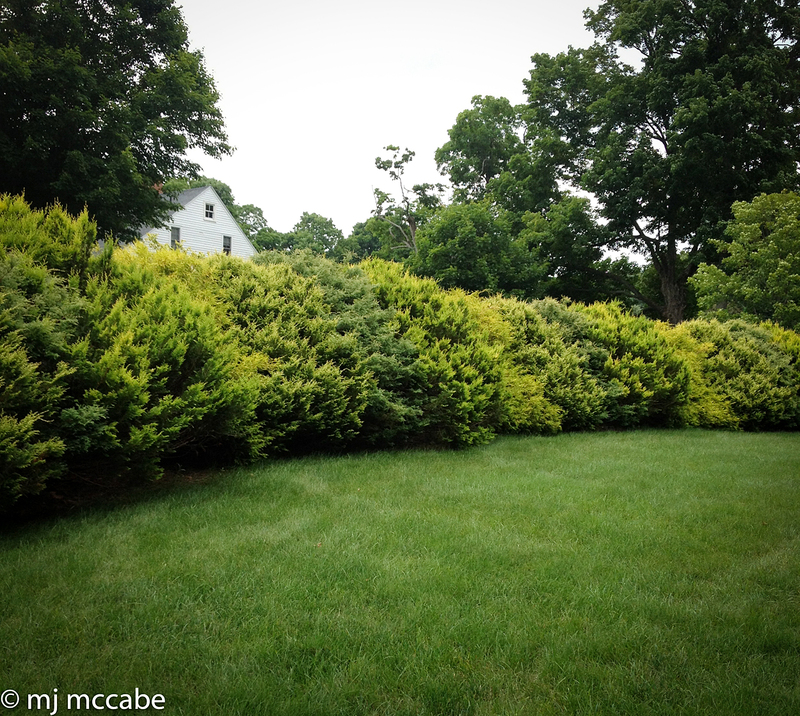 If space allows, create garden beds that are 7-10 feet wide to accommodate groupings of shrubs and perennials that are massed together and layered in graduated heights and differing textures. 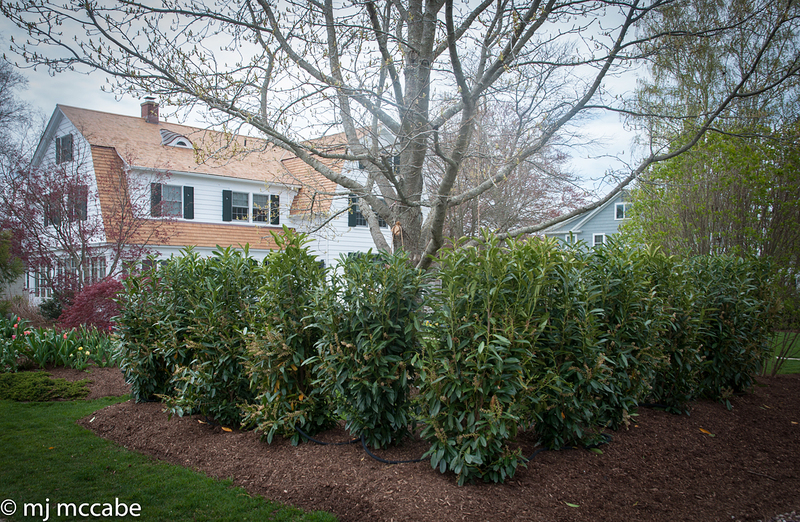 Mass planting a particular shrub has high impact in a foundation planting. 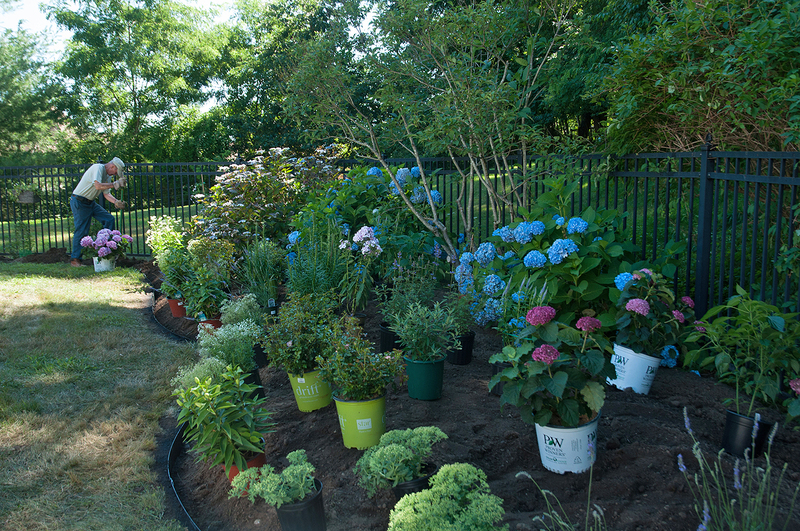 Imagine the effect of large clusters of hydrangeas, shrub rose and lavender in full bloom as opposed to a single hydrangea in a narrow bed of low juniper. Finally, the final configuration of the walkway and plantings should always be in unity and in accordance with the style of your home and its natural surroundings. Above all, it should invite family and friends to savor and linger along the walkway and provide a sense of welcome and harmony to your home. 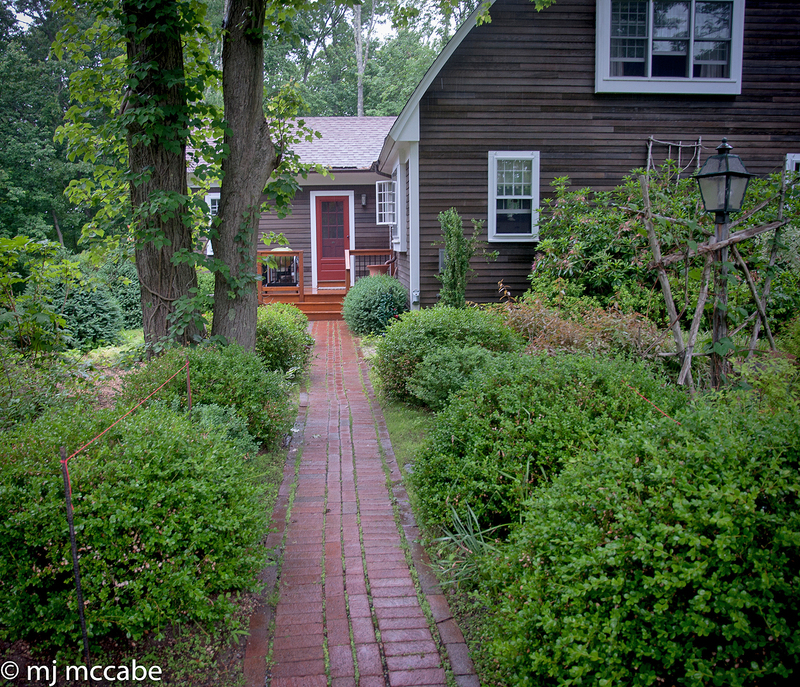 A very narrow brick walk with tightly clustered boxwood hedges makes this entrance look claustrophobic and uninviting. 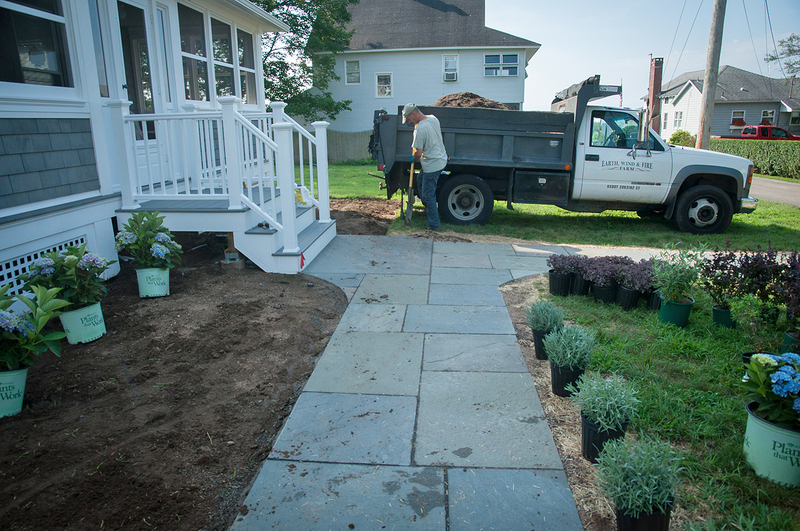 The walkway is widened with a mixture of bluestone and the brick is reused to edge and define the walkway–plantings are lower and work to enhance and make the walkway more inviting. The new walkway flows seamlessly into a generous patio. When we think of Roses it immediately conjures up lots of romantic thoughts— our grandmothers may have had fabulous beds of roses, weddings are festooned with roses — they are luscious, fragrant and abundant in our contemplated garden. 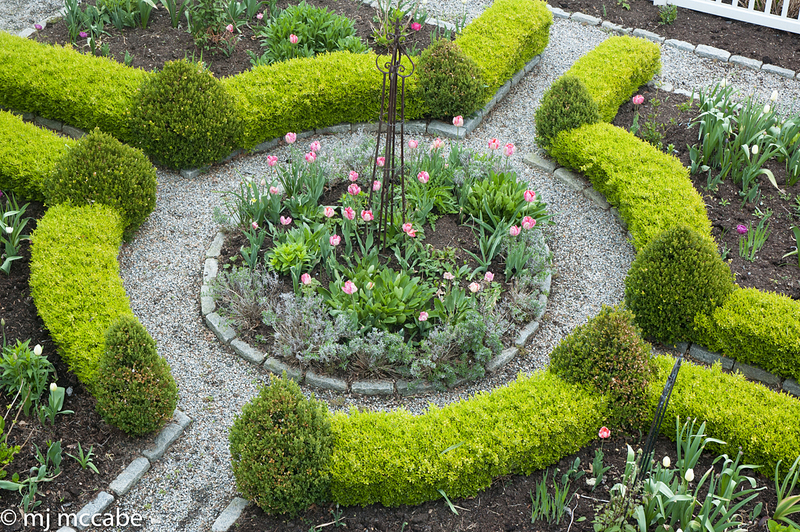 When thinking about designing a new garden everyone wants to weave in some of these fanciful beauties as they epitomize the idealized garden. But they can also be known to be persnickety and overly fussy —they get black spot, a vast array of bugs descends seemingly out of nowhere to devour the leaves and precious flowers. Japanese beetles seem to be visiting our gardens earlier and earlier each summer to do their dreaded damage. But take heart, there is a lot you can do to prevent these diseases and critters from destroying your dream rose garden. Initial good preparation of the soil is vital, along with selecting the right varieties that are disease-resistant and long-blooming. Select a site that gets about 6-9 hours of sun a day, and good drainage is imperative as roses do not like having “wet feet.” When planting a rose, dig a very generous hole about twice the size of the rose. 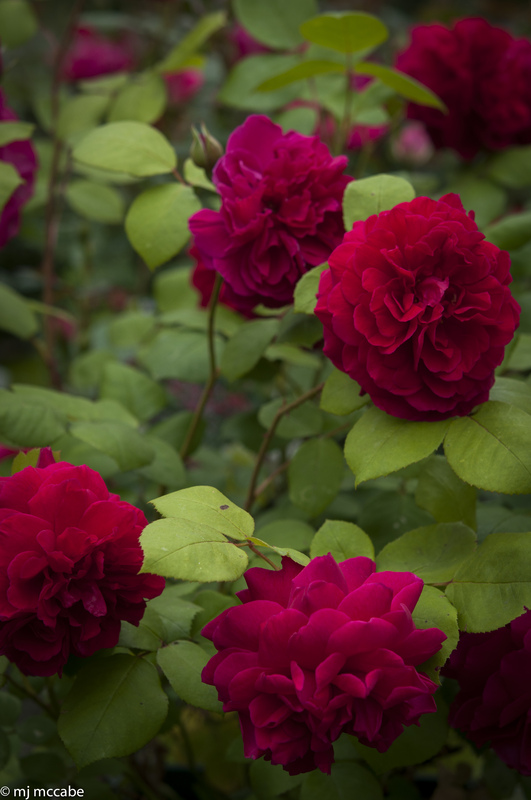 Be sure to give the rose a generous area to grow in as good air circulation is essential to healthy roses. Plan on planting new roses either early in the morning or on an overcast day — avoid planting on sunny hot days or late in the day. 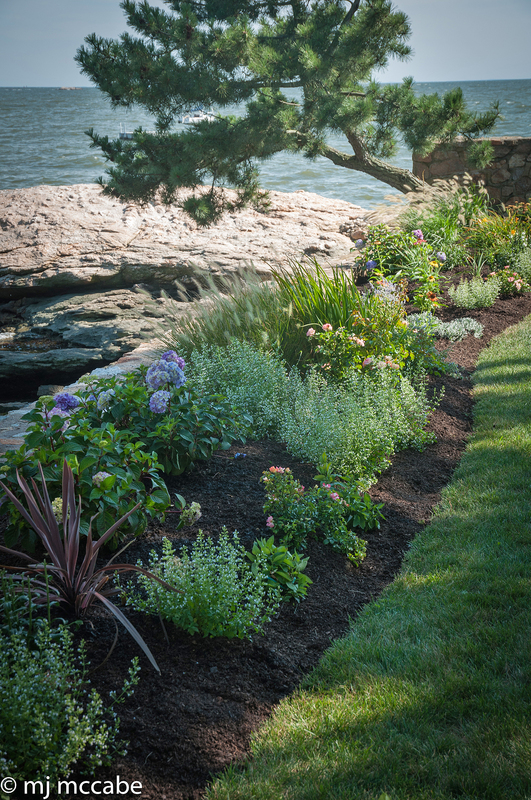 Remove heavy or clay like soil and discard replace with either home grown compost or lobster compost which is abundant in beneficial trace minerals. 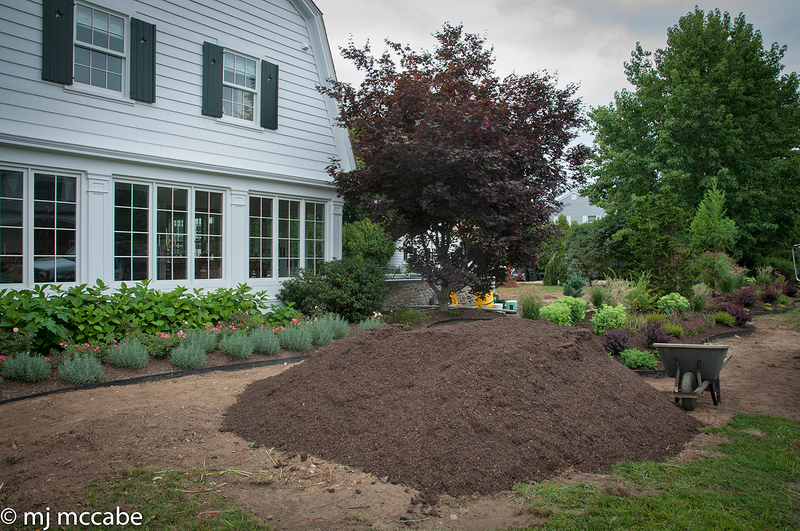 Fill the new hole with approximately 1/3 compost, add a slow release organic fertilizer which will gradually feed the rose throughout the growing season. Carefully, remove rose from the nursery pot and place gently in the new hole. Continue adding compost allowing the roots to settle in and fill the hole. At this point, it is time to water the rose before filling the hole completely. Fill a large watering can with about 3 gallons of water, add about 4-5 tablespoons of liquid sea weed and fish emulsion fertilizer. Water the hole well, allowing the water to seep in very gradually. Wait several minutes and water the rose again — repeat this process a third time before backfilling the hole with more compost–tamping gently with your foot to fill in any air pockets. Aim to position the rose at the same depth it was growing in the nursery pot. Allow the rose to settle in for a few days and repeat with a very diluted solution of sea weed and fish emulsion. Aim to allow the rose to receive about 1” of water per week to get it well established. To prevent black spot and other diseases, spray regularly with diluted Neem oil, 2 tablespoons of baking soda and a small dash of liquid dish detergent. Consistent use of this combination will prevent and eliminate the typical dreaded rose diseases. I aim to spray my roses every 7-10 days. Spray early in the morning or on cool overcast days. Do not spray rose on hot sunny days. Excessive periods of rain may increase mildew and black spot. 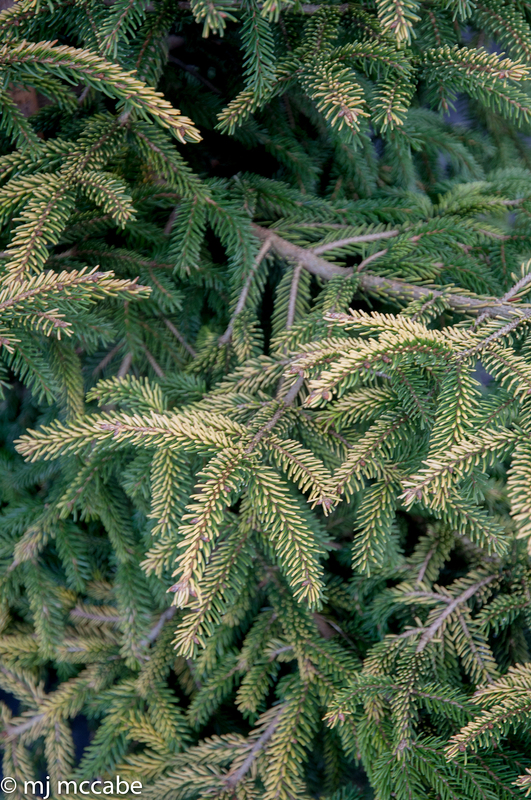 To revive them, you can cut them back about 50% — remove and discard any diseased leaves and flowers especially from the ground surrounding your beds.